Here we are. 2017. Today’s strip feels very much like a “New Years” theme. Funny, a good idea in a way — but you’re gonna pay for it later. Everytime I think: “Oh, yeah now he’s setting up a classic scene”, out of the blue something like the twist above happens. Ode to Joy in the form of a comic, this is! Hwan thinks he could contain Yuri. What’s a grown-up manly non-sexual version of the word “adorable”? Haha, this one’s an instant classic! Talk about being untrustworthy, he certainly is. Yes lock himself in right away. I’d be gunning for him myself if he did that tor me. I’d worry more about Joyce than anyone. She can wait for revenge until the time when it will hurt the worst, and her revenge would be by far the most cruel. With every new Spacetrawler chapter, Nogg will spend more and more time locking himself in the brig to avoid recriminations from surviving crew members shanghaied in previous chapters. 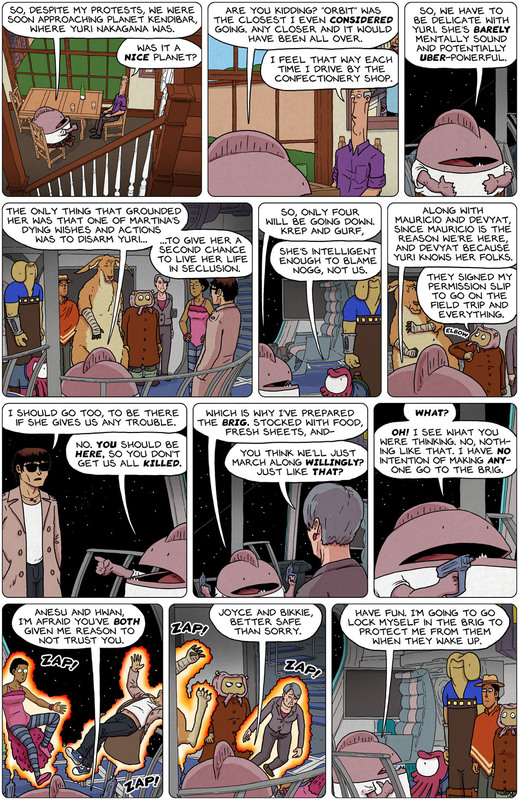 In fact, Spacetrawler XV (in which Nogg sets out to repair the damage inadvertently done in Spacetralwer VII to XII) will be entirely told from inside the brig – even after the crew finally decide to abandon ship in the Brogram’s Armpit Nebula (but neglect to tell Nogg about this). From that point on the franchise can only be extended using flashbacks brought on either by nostalgia (Nogg) or drug use (Krep) until the series is re-booted by J.J. Abrams junior with Nogg being re-cast with a lean dolphin-alien from Beta Centauri, a blatantly speciecist decision which aficionados of the original series will not tire to lament. Wow! My esteem for Nogg’s intelligence, fore-thinking abilities, and iron will for doing what needs to be done, has just skyrocketed. Who knew he had it in him? He’s got the makings of a heroic captain yet!